Camp Odayin is a non-profit organization fully funded by corporate gifts, fundraisers and donations. The only charge for a camper to attend is a $25 registration fee. In order to continually provide and expand our programs, we rely on support from people like you. Your gift will continue to give many families a place where kids play, worries rest and fun happens! For that we are grateful. Camp Odayin is a 501(c)(3) organization and charitable contributions are tax deductible. Our Federal EIN is 41-2014358. 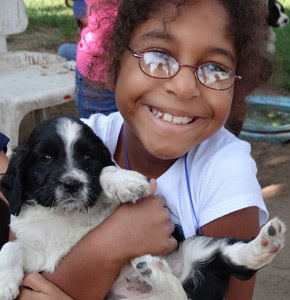 Camp Odayin provides positive life changing experiences for some really amazing children. Make a donation online and help send kids like Meaghan to camp. To give by mail please send a check, along with your contact information to Camp Odayin, 3503 High Point Drive North, Suite 250, Oakdale, MN 55128. Double your gift to Camp Odayin by having your employer match your contribution. Many companies have a 2 to 1 matching program (example: your gift of $100 could be a $200 gift to camp). Check with your human resources department about your corporate matching gift program. It is easy to donate to Camp Odayin through the United Way. Simply select option B on your annual campaign form and write in: 41-2014358. Your support is appreciated and your donation is tax deductible. AmazonSmile is a simple and automatic way for you to support Camp Odayin every time you shop, at no cost to you. When you shop at smile.amazon.com, you’ll find the exact same low prices, vast selection and convenient shopping experience as Amazon.com, with the added bonus that Amazon will donate a portion of the purchase price to Camp Odayin. On your first visit to AmazonSmile (smile.amazon.com), please select Camp Odayin as your chosen charitable organization to receive donations from eligible purchases before you begin shopping. AmazonSmile will remember your selection and every eligible purchase you make at smile.amazon.com will result in a donation to Camp Odayin. When you donate a stock that has gained in value to Camp Odayin, you do not have to pay capital gains tax and you can itemize a tax deduction for the entire amount of the stock. For example, say you bought 100 shares of a stock at $10 a share a couple of decades ago. Now that stock is worth $50 a share. What was worth $1,000 when you bought it is now worth $5,000. Normally, if you sell the stock, you have to pay long-term capital gains taxes on the $4,000 gain that you made. If you donate the stock to Camp Odayin, however, you are exempt from the capital gains tax. You can also itemize the entire $5,000 current value of the stock on your taxes. Camp Odayin can choose to sell the shares immediately, for $5,000, without paying taxes (due to our tax exempt status), or it can hang on to the shares in the hopes that it will yield more down the road. Contact us request financial documents and conflict of interest statement.